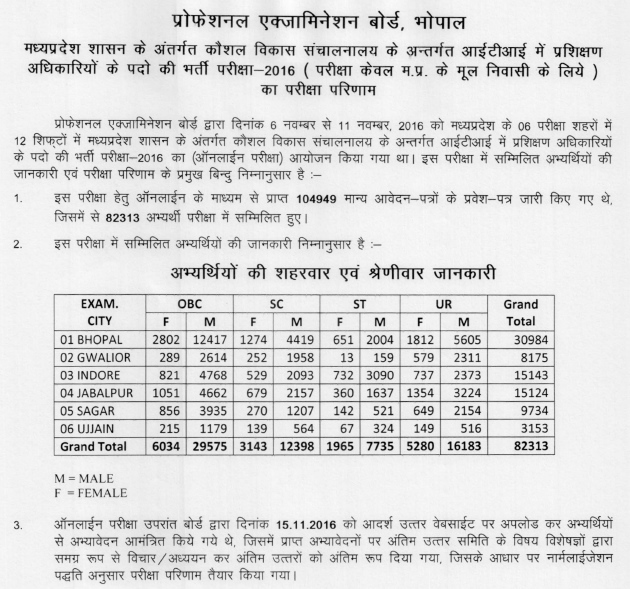 MP ITI TO Result 2016 - Check MP Vyapam ITI TO Merit list Prashikshan Adhikari Exam cut off marks - MP Vyapam had organized the written exam for Kaushal Vikas Sanchalnalay (ITI) Training Officer posts on 06, 07, 08, 09, 10, 11 November 2016. The exam was held at various centres. All those who had appeared for this exam, might be searching for Results to know whether they have been qualified or not. Through this page, you will be able to check MP ITI TO Exam Result via below link. The result of Koushal Vikas Sanchalnalaya (ITI Training officer) Recruitment Test - 2016 had been declared on 09 May 2017. You can check it through below link. A total of 463 Training Officer posts will be filled through this recruitment in various ITI. The application process was started from 13 September that ends on 12 October 2016. The websites used for registration of applications were peb.mponline.gov.in or vyapam.nic.in. Now the test is over and result preparation is under way. The results had been prepared and declared. Appeared candidates can check/ know their marks obtained in the exam from below link. The objective type written test was of 100 marks with a time limit of 2 hours. 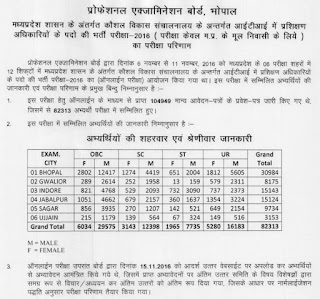 Those who got the required enough marks to clear the cut offs will be able to qualify for next round. We will be posting a direct link that will let you know your results very quickly after the announcement of results. MP Vyapam will be declaring the Results of MP Vyapam ITI TO likely around the date given above. You can know your marks obtained as well as the result statistics through the result note.